Maybe you’ve never thought about playing piano on a bunch of bananas or turning Grandma into a space bar, but once I saw this cool new gadget that lets you turn (almost) anything into a computer key. Think of it as one Father’s Day gift that will bring your family a whole lot more fun than a tie. Unless you also turn that tie into controls to play Pacman. 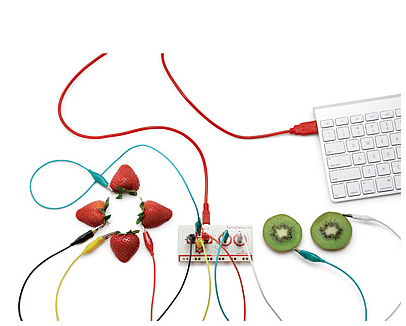 Working on the principle that ordinary objects can still conduct electricity, the MaKey MaKey Invention Kit allows you to connect things like playdoh, food, or even a pet to the little MaKey MaKey board. With that board plugged into your computer, you basically “trick” your computer into thinking the objects are your keys or mouse. It is so cool, I watched the demo video with my mouth hanging open. One warning: Unless you don’t mind hearing your kids beg, don’t watch it with them in the room. 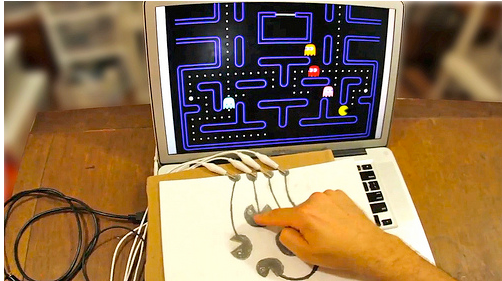 Created by two graduate students at MIT Media Lab, MaKey MaKey is one of those computer gadgets that someone with very little by way of super technical computer smarts (i.e. me) can figure out. And if you’ve got a real techie in the house, they’ll love exploring all the many capabitilies, like the area for using the expanded keyboard ports and Arudino mode compatibility. Grab your own MaKey MaKey Invention Kit at UncommonGoods. And once you have come up with your own creative use, enter the Group-How-To Contest by June 30, 2013 for a chance to win up to $1000.